So, I saw Interdpth's hack of Zero Mission called Disturbance, and it was unfinished. I found the latest version of it and made changes to it so that it might be considered a new game- although a large majority of the room layout is the same, the map layout is largely changed. Major modifications to the route. I am not sure if Interdpth is okay with this because I kind of just took his partially finished hack and used his program to change it up. I may upload a patch - its fully playable, but I am not sure whether its okay with the original creator. 1. You can't leave Chozodia and go back to Crateria. Something messed up the glass tube thing and it just doesn't do anything. 2. You get stuck in a spot in Norfair if you go for the wave beam without Speed booster. 3. Door's glitch sometimes, wierd and uncommon but they can be morph balled under or reopened. Youll know what I mean if you see it. 4. The map is useless, and I have no intention of fixing it. I used rooms in different spots, so the map is not helpful at all. 5. Graphical glitch at the beginning. happened to the original hack. pause and unpause in order to fix. 6. 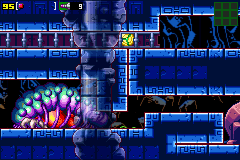 YOU CAN FACE MECHA RIDLEY WITHOUT DEFEATING THE MOTHER BRAIN, OR ANY OF THE METROIDS. 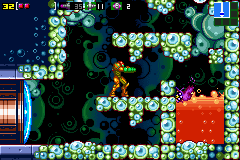 7. you can also fight the chozo guardian with your suit. 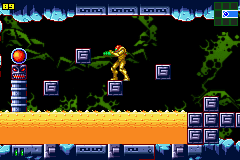 10. there is a door in ridley that is effectively a wall. My only guess is that creator thought that zero mission was too difficult. You start with power grip and get hi-jump in the next room. No long beam before hive room, but you can get 20 missiles before it. Platforms were added to make getting early varia trivial, and after you get varia, you also get a super missile pack, which give 3 missiles per pack on normal. Unknown items are enabled. In contrast to this, Kraid and Ridley seem to have more health. 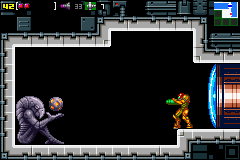 Kraid was still trivial, but Ridley on the other hand is a missile sponge. After three attempts to stop wasting ammo on his tail swipes I figured I'm probably doing something wrong. Turns out he's vulnerable to charged plasma, and since I also had wave and gravity at that point... 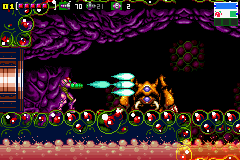 In retrospect, it's odd that I had to fight cocoon without ice. Probably should have checked if he was vulnerable to screw attack. Couldn't find a way into tourian(except backdoor, but it was in escape state, so door to mother brain was gray), but gravity meant I could get power bombs and go into chozodia and complete the game anyway. Guardian and mecha ridley seemed unchanged, but escape sequence timer started at 99 minutes(or hours?) and just disappeared in the next room. There were some ideas in this hack(not necessarily good or finished), but (barely) enough to keep me playing up to chozodia. Sadly chozodia itself seemed unchanged(except maybe some missiles were changed to supers? 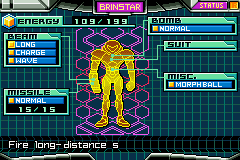 ), and only interesting moments were game being confused when I got to places where suitless samus couldn't get to. Can't really recommend this to anyone, but I've definitely played worse hacks. P.S. You can leave chozodia. Either open high way first and return through that, or break the glass after guardian fight.